Cornell’s proposed research facility. Image: Red Square, Inc. for Polshek Partnership Architects. Cornell’s need to expand supported granting of variance. 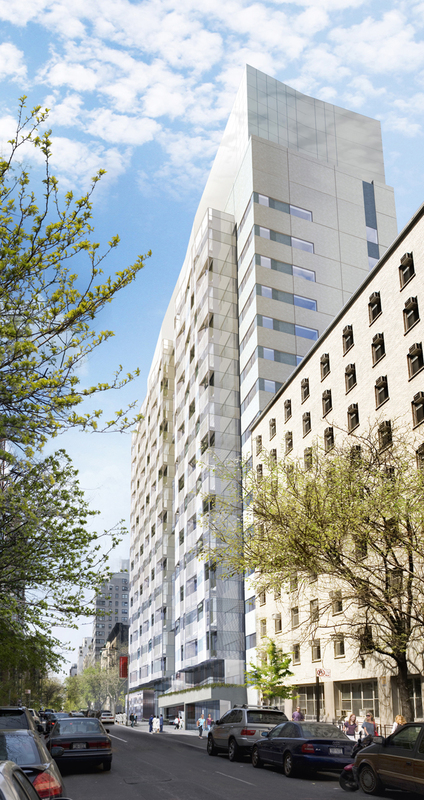 Cornell University applied to BSA on behalf of Weill Cornell Medical College, a non-profit educational institution, for a variance to construct an 18-story biomedical research facility at 411-431 East 69th Street in Manhattan. The development site includes portions of five tax lots comprising a single zoning lot. Cornell intends to demolish three buildings within the zoning lot to construct the new facility. The proposed building would be constructed at nearly double the permitted FAR and triple the permitted street wall height. Cornell claimed that its current research facilities were outdated, and that the proposed building was necessary to efficiently increase its medical research capabilities. Cornell presented proof that institutions with similar missions required laboratory floor plates between 20,000 – 35,000 sq.ft. Not including mechanical space, Cornell’s facility would have 21,752 sq.ft. floor plates. Cornell also claimed that the proposed location for the research facility was ideal because nearby patient care facilities would help facilitate clinical research. Although Manhattan Community Board 8 supported Cornell’s application, local residents argued that Cornell failed to demonstrate that the site contained unique conditions, and that any hardship was self-created based on Cornell’s desire to expand. The opposition further claimed that Cornell was not entitled to deference as an educational institution because the negative impacts of the development outweighed the proposed public benefits. BSA granted the variance, ruling that Cornell established a programmatic need to expand and that the proposed design called for the smallest variance required for efficient expansion. BSA reminded the opposition that an educational institution’s need to expand was not a self-created hardship.